The Elven Magic Slot by Red Tiger Gaming has a beautiful Elven theme. The artfully designed reels and symbols are located in front of a gold shimmering forest. Matching this beautiful atmosphere is the sound – very quiet and you hear very soothing sounds. 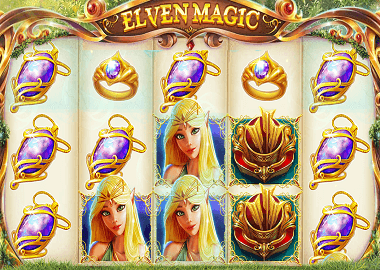 The Elven Magic Slot is one of very few slots that does not offer a Free Spins feature. But the game even has 5 different bonus features which are all activated in the base game. In summary: the Elven Magic online slot has a few surprises for you. The reels and symbols on the Elven Magic slot are standard: you play with five reels, three symbols on 20 fixed paylines. The symbols including 4 cards symbols and the theme related symbols: a golden ring, an elven queen, a necklace, a bunch of arrows and a golden shield. The golden shield symbol is also your Wild symbol. If you get 5 of these golden shields, you trigger the top prize: 1000x your bet and with maximum bet no less than £500.000! The Elven Magic Slot does not offer a Free Spins feature but 5 additional bonus features: Archery Bonus, Arrow of Fire, Arrow of Wind, Arrow of Nature and Arrow of Ice. Each of these features are randomly triggered in the base game. Archery Bonus Feature: You need 3 bonus symbols (the Target symbol) to activate the Archery Bonus. Take your pick from three quivers of arrows and find out how many times you can shoot at the targets. You can win up to 500x your stack! Arrow of Nature: This feature is very valuable because the Elven Queen shoots with their arrows on your reels and your symbols turn into Wild Symbols! Arrow of Ice: The Elven Queen shoots arrows of ice on your reels. Instantly all top paying symbols freeze in place and a re-spin is triggered. Arrow of Fire: In this feature, the Elven Queen shoots fire arrows at your symbols. These then burn off and are replaced by new symbols. Arrow of Wind: The Elven Archer shoots an arrow of wind on your reels to leave tiles on your reels spinning. Behind them new fresh symbols turning up. The Elven Magic Slot is a very interesting game and has fully convinced us. That there are no free spins, you forgot after a few seconds. The different Arrow features are exciting and deliver very nice winnings. The slots also have a return to player of 96.12% – a reasonably high value. You can play the Elven Magic Slot here for free (click on the banner above). More information about Red Tiger Gaming can be found here. Red Tiger Gaming Slots are UK licensed and you can find them at 888 Casino and 777 Casino, for example. More online casinos with Red Tiger games are listed below in the table.